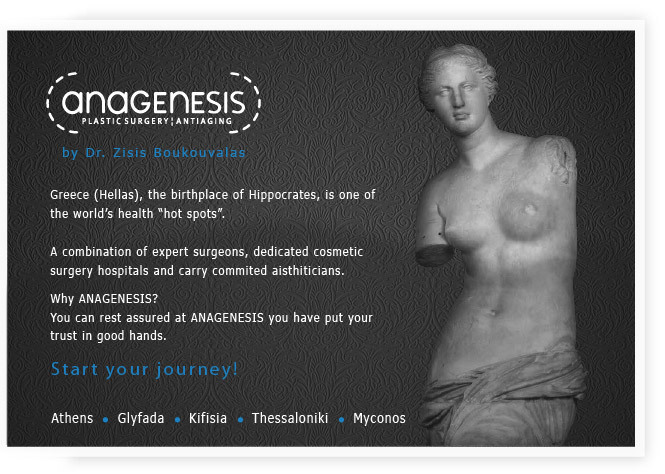 Anagenesis is a Center of Aesthetic & Reconstructive Plastic Surgery and Laser applications. Dr Zisis Boukouvalas is the Scientific Director of the Medical team and CEO of Anagenesis. In the Anagenesis Centers all problems regarding face,body or skin conditions are addressed and treated. Any and all questions that may arise will be easily answered while you navigate through the pages of our website. All the various activities and treatments will be explained in detail. Anagenesis's goal and vision is to elevate the standard and quality of life for a lot of people in our society. This is achieved through the dedicated incorporation of proven cutting edge technology devices and application of advanced medical techniques in the fields of Aesthetic & Reconstructive Plastic Surgery and Lasers. Our goal is to enhance the feeling of self esteem and self confidence for as many people as possible at an affordable cost and through a technologically excellent, friendly and safe environment. All the treatments are administered by a highly trained medical and paramedical staff that is responsible, sensitive to the needs of the patient and takes pride in its work.